The ACP is very active in discussing regulations with FIDE and continental organizations, and its success in this field is to the benefit of the chess community as a whole. The ACP offers assistance to its members on various chess-related legal issues. The ACP successfully protects the rights of chess professionals. The ACP acts as a mediator between players and organizers and proved successful in reducing conflicts. ACP Premium members are automatically enrolled in the ACP Tour. The ACP Tour is a yearly tournament circuit administrated by the ACP, which includes the world's most important tournaments. Players who take part in these events gain points according to a ranking system devised by the ACP. Once the yearly season is over, the best players are qualified for a final event, called the ACP Cup . Players get a chance to compete for wild cards in prestigious events and have access to special prizes. All ACP wild cards are distributed based on the ACP Tour standings. 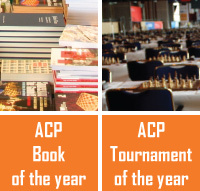 The ACP promotes and organizes a number of high-level tournaments to the benefit of ACP members. The ACP negotiates with national chess federations and world leading companies for organizing activities under the aegis of the ACP and for raising funds for ACP projects.